Jeff Gordon's DuPont No. 24 is getting a new look and name. DuPont's paint business, a longtime sponsor of Gordon's No. 24, has been sold to the Carlyle Group and been rebranded as Axalta Coating Systems and the company will fulfill its 14 race sponsorship of Gordon's car. “While these are big changes for us, our commitment to the No. 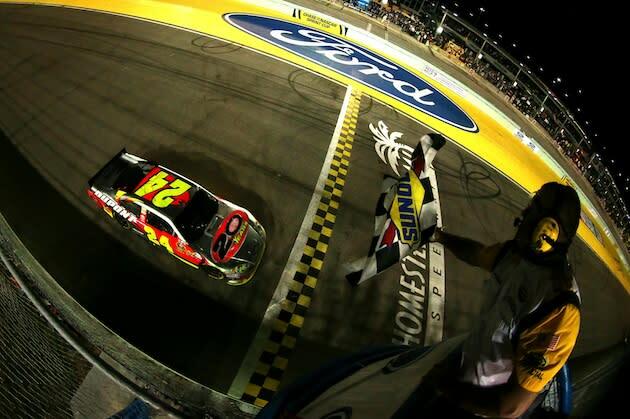 24 team, Jeff Gordon and NASCAR remains the same,” Axalta Coating Systems president John McCool said in a release. “We are proud to continue our sponsorship of the No. 24 team and Jeff Gordon in 2013." The changeover will be official in the second quarter of the year -- after the company's first scheduled race at Texas in April. According to the statement, other brands under the now Axalta label will fill Axalta's races until the change is renaming is complete. After being the four-time champion's main primary sponsor since he started his Sprint Cup Series career, DuPont scaled back to a partial season as a primary sponsor in 2011 and the AARP's Drive to End Hunger came on board. Fittingly, his final race in DuPont colors was in last year's season finale at Homestead-Miami Speedway where Gordon won. The Carlyle Group's other holdings include Hertz Rental Car, which recently announced a sponsorship agreement with Penske Racing. Hertz will sponsor Joey Logano in the fall race at Charlotte and seven Nationwide Series races.